More from Debbie Beere at Dbeere Yachts as she sends word that Sunseeker’s 39.12m motor yacht Larissa has had a further price cut of £245,000. 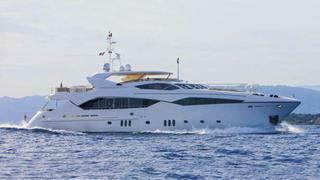 Built in 2010, Larissa is the first and only Sunseeker 130 Predator to come on the market. MCA compliant, a stunning interior in satin walnut sleeps 12 guests in a master suite, two double staterooms and two twin cabins with Pullman berths. Twin 3460hp MTU engines push her to speeds of 26 knots. Larissa is now down from £8,495,000 to £8,250,000.